Metal sculptor John Crawford’s solo show at Lori Bookstein in Chelsea from April 24 through May 24 is the result of favorable comments about work in a summer show two years ago. 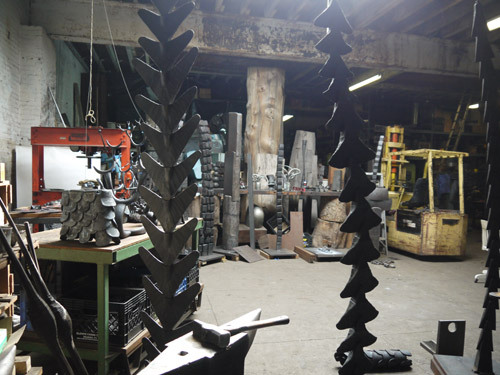 His studio, high-ceilinged and immense, is filled with a Piranesi-like array of chain hoists, presses, a forklift, milling machines, hammers and anvils in different sizes, tongs, and other metalworking equipment, along with raw materials —wood, copper, steel, and tin. (See http://johncrawfordsculpture.com/) Wood and metal sculpture, including some humongous tree trunks incised and stacked almost to the top of the space, stand as sentries. Long worktables rest upon table-height slices of tree trunk. Crawford has been here, in Brooklyn, for almost thirty years. Before that, he apprenticed for about ten years in Italy, making forged steel sculpture and exchanging work for training with Tuscan blacksmiths in a 16th century forge where he learned to make shovels, hoes, axes, and other hand-held farm tools. Despite his tendency to dwell in his quiet, cave-like studio (and the patio garden above it), Crawford has appeared in Art in America and in Sculpture Magazine (in 2000 when he had an exhibit at Queen College), and in the New York Times, ARTnews, and Artforum before that. Even though Crawford avoids symmetry and uniformity, his singular vision involves creating series of forms from similar geometric or biomorphic shapes or modules. Similarity and difference are built into each hand-forged part of each work. Some of the bodies of work that willbe shown at Lori Bookstein Fine Art are the Towers, the Bifurcations, and the Accretions – all made of repeated shapes with some variation that create a more complex whole. John Crawford, Tower 5, 2006. 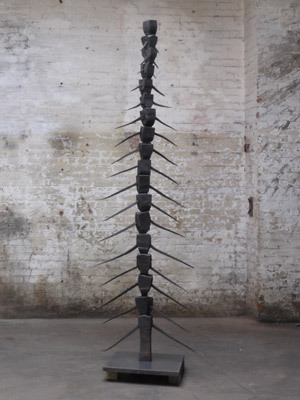 Forged steel, 86 x 25 x 3 inches. Courtesy of the Artist and Lori Bookstein Fine Art, New York. The Towers are spine-like structures in copper or steel that can echo organic forms as well as tool shapes. A central axis holds hoe-like or otherwise-shaped “branches” that change slightly in size and shape as they are placed higher and higher on the vertical axis. The Bifurcations lose this central axis. They continually branch by repeating and doubling a shape and changing its scale. For example, Bifurcation Arches, 2013-14, utilizes repeated “C” shapes, which attach to each other “ends-to-middles.” As John adds two additional C shapes to the ends of each C, he pays attention to the overall balance. Metaphorically, he notes, the arch shape “is somewhere between antlers and tree growth – Have you ever seen the rooms full of antlers at the Berlin Museum of Natural History?” Each hand-forged metal arch is unique rather than an exact copy, and sometimes one branch stops while another continues. Bifurcation 7 –Delta is a repeated Y-shape that curves to the right like a bent or sweeping straw broom. John Crawford, Bifurcation-Arches, 2013. 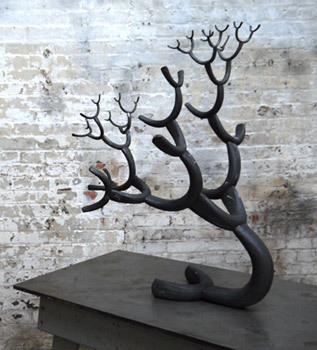 Forged Steel 33 x 22 x 24 inches. Courtesy of the Artist and Lori Bookstein Fine Art, New York. The Accretions, my personal favorite, are “MBT” forms. “MBT”s, Crawford explains, means Mouth Bites Tail: the mouth of each “Y” shape bites the tail of the “Y” above it. Like steel fabric, the final “accreted” form may widen, narrow, tilt, or otherwise expand and contract. “How do they twist?” I asked John. “These are forged hot. When the metal is hot, it is soft, so I can bend and twist it as I add the units,” he replied. The Towers, Bifurcations, and Accretions are metaphors for human differences, similarities, and ways of fitting together. Other forms, such as Wall, 2014, and Pine Cone 4, 2013, are based on the spiraling petals of pine cones. Like the Bifurcations, the Pine Cones are mathematical without being enslaved to a formula. well done John, your works has been a source of inspiration to my metal works. FANTASTIC !!!!!!! met you at AG tuesday LOVE your art !!!!!!!!!!!!!!!!!!!!!!!!!!!! !